1. The ordinary readers, who will be fascinated and also shocked to learn what performers endure in their quest for a musical career. 2. People with frustrated dreams who were categorically discouraged from expressing their artistic gifts simply because they were not thought to be talented enough. 3. 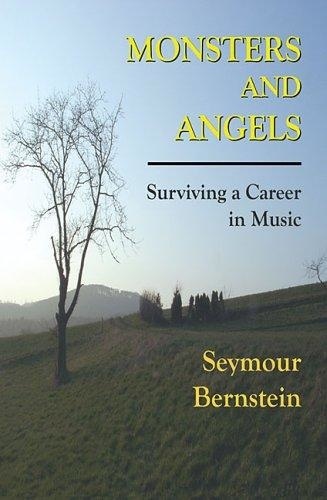 All musicians, professional and otherwise, whom Seymour Bernstein offers advice and career alternatives in a profession fraught with frustration, deception, and heartaches. Monsters and Angels – Surviving a Career in Music is really about surviving life itself. In recounting my own survival, I hope to speak for all people, professional and otherwise, who strive to express their artistic passions. Self-expression through music is perhaps the deepest source of satisfaction available to mankind. Yet, the process through which our talent allows us free expression is fraught with difficulties. Chief among them is the struggle to achieve a balance between our artistic and personal selves. “Does my performance measure up to what others can do?” “Will I ever be recognized for my efforts?” “I can’t live without my art; but how can I practice seriously and support myself at the same time?” These are some of the questions addressed in this book. As everyone knows, parents, teachers, siblings, and friends shape and influence our lives for good and for ill. Survival, as I see it, depends to a great extent upon how successfully we learn to differentiate between the “angels” and “monsters” – those whose sole intent is to benefit us, and those who seem neurotically driven to dominate and control everyone within their grasp. Adulthood, however, has one distinctive privilege: it gives us the right to reject certain authority figures – even a parent, if need be. My overview of music education and performing careers is not a positive one: Composers and performers of the twentieth century are now separated from each other; ruthless managers have turned the performing scene into a veritable Armageddon; and some music critics demean music and performers and infect the public with the poison of their own boredom. Worst of all are certain teachers and managers who use their reputations and positions of power to demand sexual favors from young musicians. On the positive side, amateur musicians protect the sacred art of music even more than most professionals do. There are, to be sure, dilettantes among them. But some amateurs have achieved the level of competence that we associate with professional musicians. They differ from professionals, however, in two respects: they make their living in non-musical fields, and they perform and compose for one reason only – a love of music, as the word amateur implies. Strange as it may seem, many professional musicians, caught up in the vicissitudes of careers, have all but forgotten their initial love of music. To elevate serious amateurs to the status they deserve, I have placed them in a new category – the professional-amateur. The future of music is safe in their hands. In the end, it is they who will defend and promulgate music, not to gain public acclaim, but to benefit from and communicate music’s harmonizing properties, and not for financial gain, but for the spiritual enlightenment which money cannot buy. Genius always manifests itself, whatever the obstacles. But what of us non-geniuses? How do we find the courage to pursue our individual callings in the face of a society that bows to fame and money above everything else? I trust that others may find their own answers to this question as I relate my musical and personal experiences. For somehow, and in spite of everything, I have survived. I have shed my victim status and am now in control of my own destiny. Often, people who have worked their way into positions of power have tried to undermine my efforts. One of them, a well-known writer, said to me, “Oh, have you done enough to write your memoirs?” Given his great accomplishments and generosity towards struggling gifted musicians, plus the fact that he admired my book With Your Own Two Hands, I thought he would have a clearer perspective about everyone’s right to self-expression. Yet his question seemed to imply that while people like Artur Rubinstein have with good reason written their memoirs, who am I and what have I done that I should write mine? I am sure that my response, “Yes, I believe I have done enough,” made him think I was as arrogant as my intention to write my memoirs. This book is my answer to him. It affirms the right of all people, whatever their level of advancement, to develop and express their talents. Its chief purpose is to justify and encourage people like me who are not geniuses, and not world famous, but who are, nevertheless, imbued with an artistic passion which cries out for expression. It proposes that self-development and self-fulfillment are among life’s greatest rewards. Ultimately, self-fulfillment reaches out beyond the self, enabling and inspiring us to contribute to others in countless ways. This giving of oneself, to be sure, brings the greatest rewards of all. As I have discovered, the best antidote to rejection and discouragement is to marshal the courage to begin all over again. In the end, we and we alone know our strengths and weaknesses. Many of us are called. But to disagree with the last half of this familiar adage, we can be chosen, so long as our goals remain both idealistic and reasonable. With perseverance, we can, as the great scholar and classicist Gilbert Highet put it, “outsoar” our origins. Seymour Bernstein has accrued scores of “triumphs” in a variety of activities. He studied with such notable musicians as Alexander Brailowsky, Sir Clifford Curzon, Jan Gorbaty, Nadia Boulanger, and Georges Enesco, both in this country and in Europe. His prizes and grants include the First Prize and Prix Jacques Durand from the international competition held at Fontainebleau, France, the National Federation of Music Clubs Award for Furthering American Music Abroad, a Beebe Foundation grant, two Martha Baird Rockefeller grants, and four State Department grants. His concert career has taken him to Asia, Europe, and throughout the Americas, where he has appeared in solo recitals and as guest artist with orchestras and chamber music groups. In 1969, he made his debut with the Chicago Symphony Orchestra, playing the world premiere of Concerto No. 2 by Villa-Lobos. Acclaimed for his “…technical brilliance and penetrating interpretive skills,” Seymour Bernstein is also an internationally known writer, composer, teacher, and lecturer. Many of his piano works are on the best seller list. His books With Your Own Two Hands, 20 Lessons in Keyboard Choreography, and Musi-Physi-Cality (the children’s version), have been published in German, Japanese, and Korean. They, along with his videotape, You and the Piano, have been hailed by critics as “…firsts of their kind,” and “…landmarks in music education.” In constant demand for master classes and educational programs, he is one of the most sought after clinicians in this country and abroad. Performances of his piano works have earned him awards from ASCAP. Seymour Bernstein maintains a private studio in New York City. In addition, he is an Adjunct Associate Professor of Piano and Music Education at New York University.